My solution for installing a Soundtraxx decoder in an RS-2 may not appeal to everyone. Because of the tight fit in the Alco RS-2 body I had to make some sacrifices. I didn't want to lose the weights in the body shell because this would spoil the locomotive's pulling power. This would have happened if I had tried to install the speaker below the fan in the front of the shell. I had thought to drill a bunch of tiny holes in the fan's screen, similar to the technique for putting speakers below the coal load in a steam engine's tender. I finally figured out that I could mount a speaker in the cab if I was prepared to sacrifice the plastic windows and the cab's interior. I was more interested in the sound than retaining the interior of the cab. It wasn't an easy installation even though I was using the Soundtraxx decoder that is a "drop-in" for the Kato RS-2. 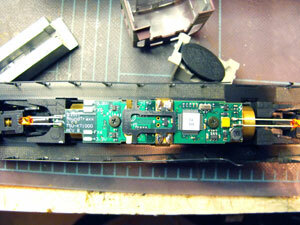 Previously I had installed a silent Lenz decoder using an NMRA style 8-pin plug into the lightboard. To install the Soundtraxx TSU KT1000 decoder, I had to carefully remove the lightboard and resolder the metal tabs that conduct electricity from the trucks and the motor to the new board. I passed the wires to the speaker through the opening in the floor of the cab, through the bottom of the speaker enclosure, shortened them so there wasn't a lot of loose wire, and then soldered the wires to the mini-oval speaker. 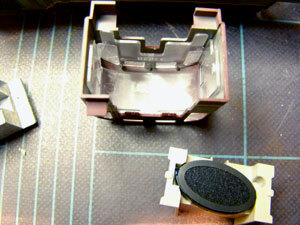 The speaker is a tight press-fit into the enclosure. I secured it with a few drops of ACC glue. The other end of the speaker wires come attached to a small plug that has to be inserted underneath the side of the decoder board. The board has its own capacitor. After considerable fiddling, I removed the plastic windows to both allow sound to get out of the cab and to allow room for the enclosure to fit crosswise in the cab. Some window panes could be added with Microscale's Kristal Clear to disguise the installation better. I had some problems getting the locomotive to run properly until I soldered the metal strips going to the trucks to the metal strips that run under the running boards. The original factory installation relied on mechanical pressure. I couldn't get the parts to touch consistently. It drove me crazy. I must have had the engine apart two dozen times trying to locate the problem. Note: Finally I got the red LED on the board to glow continually. That meant the installation was OK. It flashes if there's a short. If it doesn't come on then there's an open circuit. That was my problem that disappeared when I pushed down on the board. Here's the result of the Soundtraxx decoder installation. The speaker isn't too noticeable for our operating purposes. I'd rather have the sound than prototypical accuracy. I programmed the locomotive with Decoder Pro and used a PowerPax booster from Tony's Train Exchange. This, or a similar device, is needed to program a Soundtraxx decoder with Tsunami sound due to the high inrush current. The RS-2 on the Service Mode track. A PowerPax booster is on the left. The Lenz system is below. The programming track is totally isolated. The turnout control board for Utopia is in the background. Go from "Soundtraxx decoder" to sound installation tips.